The following article outlines the recommended steps to take when deciding on which type of gas cylinder storage is most suitable for your needs. If there is sufficient space externally for secure storage, which is the preferred option of the HSE and BCGA, then our G-OD outdoors range can be considered as an alternative to external cages. If there is no sufficient external space, then explain that the second option to be considered is a dedicated fire rated and ventilated storeroom to house the minimum number of cylinders needed for any process. If the customer cannot conform or agree to either of the first two options, we can introduce asecos cabinets which are manufactured according to BS EN 14470-2. Also explain that the cabinets are available in 30 minute or 90 minutes fire resistance and must be ventilated without exception. Finally, that metal pipe work (stainless steel is the preferred choice due to its low thermal conductivity) or electric cable can be fed through the roof without compromising the fire rating. 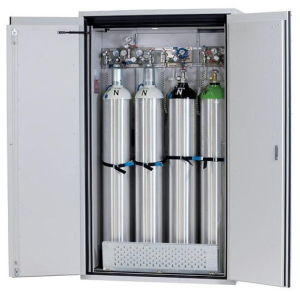 asecos gas cylinder cabinets are predominantly used for gas cylinders in use and indoors. 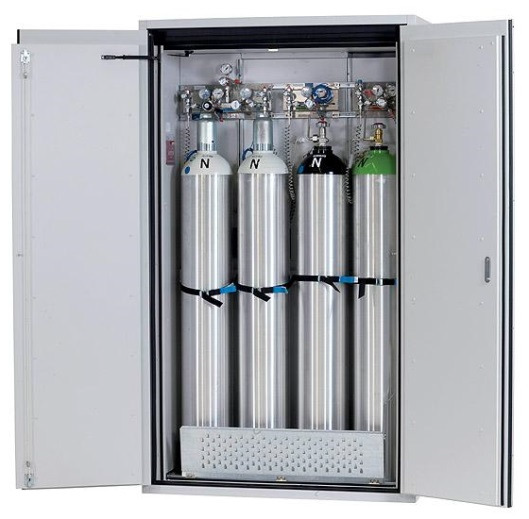 For example when very expensive highly purified gases are used, using an asecos cabinet will minimize the chances of the rapid degradation of the gas due to local storage and using shorter pipe lead throughs. This type of gas delivered by pipework from central stores may rapidly degrade the quality of the gas. Establish the number of cylinders, volumes, sizes and the nature of the gas wishing to be stored. If toxic or flammable gases are being used, recommend 90 minutes fire resistance and a ventilation rate of air change at 120 cabinet volumes per hour with an alarm. With inert and non –toxic gases the customer may consider 30 minutes with reduced extraction rates and no alarm. Note that asphyxiation can still occur. Check that the customer has extraction facilities available on-site. Remember this is mandatory for BS EN 14470-2 cabinets and it would have to be installed by a separate business if not present. Check that there is space for any recommended cabinet(s) with the doors fully open. Check that the floor can take the weight of the cabinet including cylinders. All weights and volumes of the cabinets are specified in the asecos catalogue and on the asecos website. Check that delivery is possible to the point of use. If the customer is considering delivery behind first door or entrance point, advise him how heavy the cabinets are. Codes of Practice, Guidance Notes and recommendations from UK authorities are generally the minimum requirements for complying with Health and Safety law. An end-user is welcome to use his own methods, but a court will find fault if an accident occurs and these have been established as being insufficient.